Above is a carved High-Density-Urethane (HDU)sign for a barber salon. The sign features an engraved coat-of-arms with a riding stirrup surrounded by two lions and a unicorn, as well as engraved decorative art in each of the sign corners. 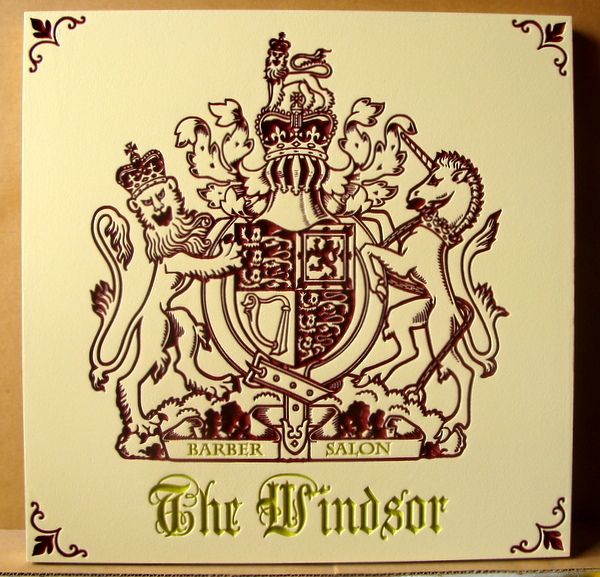 All painted areas of the sign are finished in long-lasting automotive-grade enamels and the engraved name of the barber salon is filled in 24K gold-leaf. After two applications of highest quality clear-coat, the sign is ready for either indoor or outdoor use.